An “X-ray” is a medical test that displays images of the body for doctors to study. 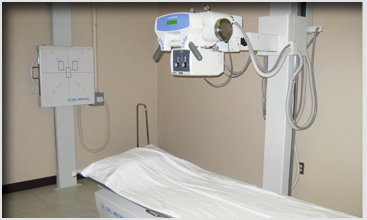 An X-ray is a fast and easy way to determine the right treatment for you as the patient. X-rays assist doctors in determining if a patient may have a broken bone, an illness, and even cancer. The pictures of the body which are produced by X-rays are displayed on a sheet of film, a type of television monitor, or a computer screen. X-rays have been in use in medicine since their discovery in 1895, by a German physicist named Wilheim Roentgen. Since this discovery the X-ray has allowed doctors around the world to look inside the human body like never before. Basically, an X-ray is a ray of visible light called a “Photon”, which is a wave of energy that is similar to the common radio wave used in the transmission of a radio or TV signal. The primary difference in an X-ray and a radio or TV signal is the strength of the wave of energy used in the transmission. Radio and television transmissions use low energy wavelengths and X-rays use high energy. When X-rays pass through the body they are absorbed by different tissues. The denser the tissue then the brighter the image e.g., bones will appear bright white; however, the lungs will appear dark since the X-rays are passing through the air in the lungs with virtually no resistance at all.